At the recent Women’s Eights Head of the River Race, Loughborough Ladies were out in town on the pull (on oars, that is) as they notched up some high profile scalps against other local clubs (or ‘Provincials’, as the London-centric organisers of the real boat race designate those rowers who do not reside south of Watford). Much to the surprise of the Southerners, the LBC ‘Provincial’ crew was not entered as ‘Pugh, Pugh, Barney McGrew etc’ but as ‘Smith, Martin, Beddows, Senior, Quinton, Haines, Henry, Storey, Harris’, better known as Jen, Sandra, Andrea, Karen, Emily, Vicky, Kate, Nadine, and The Small Shouty One sorry I mean Rachel. After travelling down the day before and spending a night in the Ritz Hotel (AKA the Hammersmith Travelodge?) 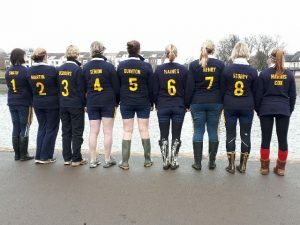 the Ladies finished a creditable 277th out over over 300 boats, ahead of Leicester, Worcester, and Warwick, amongst others, as well as crews from the Veterinery and Medical professions, and two International (Italian) Masters A and B crews. 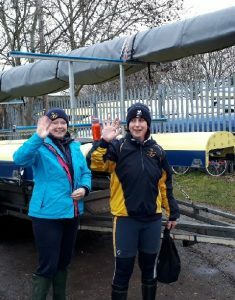 Good rowing conditions prevailed, apart from a stretch after Hammersmith Bridge when the Ladies had to push on through a difficult wind, and a finishing time of 24.36 was reward for many months of dedicated training. 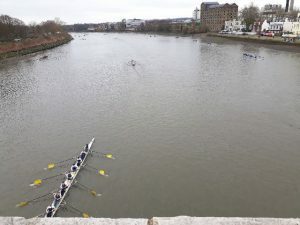 Just one second faster would have put them ahead of a much younger Intermediate crew from Devils Elbow but a moral victory was claimed by using a cunning extension of the Masters’ handicap system! Huge credit to the Ladies for flying the flag for LBC at this prestigious event.